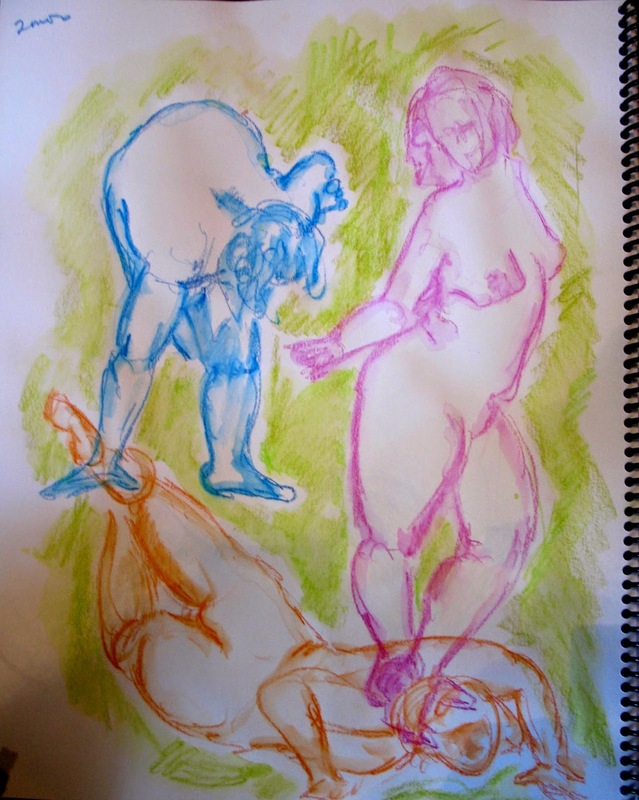 After working in black and white on grey paper for the last sketchbook, I decided it was time to return to colour so I'm using water-soluble wax crayons in the new sketchbook for Life Drawing. The crayons are Neocolor II by Caran d'Ache. The pictures posted here are actually backwards as the bottom one is the shortest poses - 2-minute sketches. I drew each pose in a different colour, using the crayons dry. Then, afterwards, I used a brush with water to wet and set the colours - and added the green around the forms. The next one is a 5-minute pose. Again, dampened afterwards. It creates interesting effects as some of it becomes a bit like watercolour and some retains the crayon look. The top one was a 20-minute pose and I had time to use more colours. It is fun to work fairly loosely and working in colours is a nice change again. What with cleaning up and putting away from DoorsOpen, getting out to paint outdoors and having our last sessions on Fridays before the summer - when kids' classes take over the art centre- I haven't photographed the new model drawings. This one was done a couple of months ago and, while it is on my Pinterest Life Drawing folder, I hadn't used it for a blog. It seems appropriate now with the World Soccer Cup going on- so here it is. We had Darwin wearing a soccer uniform for a long pose on a Wednesday night. So that was bit of fun. I tried using vine charcoal to fill in the black pastel more - and it worked. 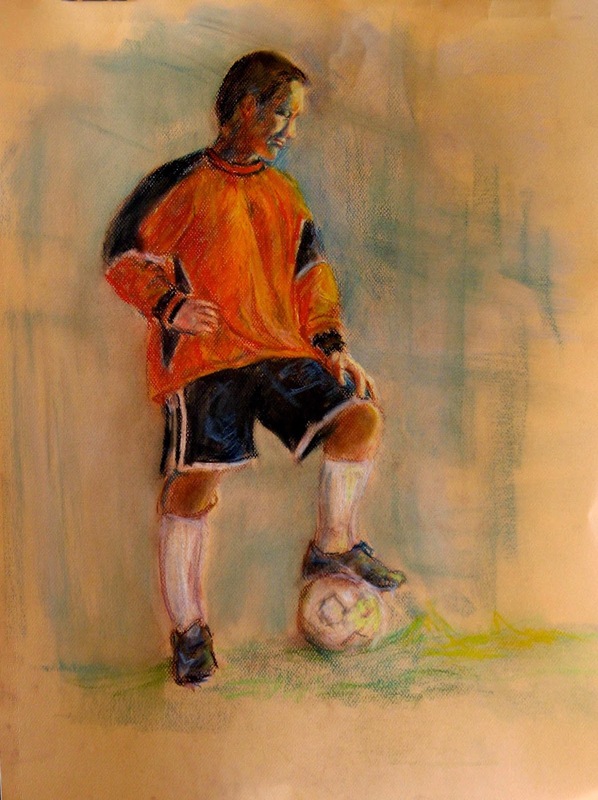 I also cleaned up some pastels and tools with shaking them in cornstarch - again, a hint that does work. I try to keep the pastels as clean as possible so as to keep the colours fresh. I felt the drawing turned out reasonably well and the light source - an indoor lamp- even was at a good angle to suggest the outdoors. I started this one just before DoorsOpen- having it roughly blocked in and intending to work on it during the Open Studio. Well, I did not get very much done. Then, the Irises, which had looked so great earlier, decided to "finish" -leaving only two survivors. I picked one - to have it as a close-up to paint by - and it promptly died! Fortunately, I had taken photos earlier so I was able to complete the painting- in spite of lack of cooperation on the part of the models. I used some quinoxidine purple, some cobalt blue, some Azo yellow and I was wondering what a medieval artist would think of the colour assortment that I have- especially the man-made colours. We, in this age, are very fortunate with our colour selection and the studies that have gone into it. The National Gallery in London, England is opening a new show called "Making Colour" with the galleries arranged by dominant colours in the paintings. The history of what was available is then clearly visible. At one point, blue was very costly as it came from the gemstone Lapis Lazuli . It was often reserved for the robes of the Virgin Mary. Today, we have Ultramarine - in red or green shade, Phthalo Blue, Cerulean, Cobalt--- a wealth of blues. Van Gogh used some yellows - one of his favourite colours- that have unfortunately darkened but today we can read lab tests about permanency and see samples for transparency or opaqueness. We really have a tremendous wealth in current available pigments. Just sent out the June Newsletter with this painting on it. This is the second plein air painting of the season. I think I'll call it "Out to Pasture". The machine is an old baler, I think, but I chose it for the contrast with the field of buttercups. As I said in the newsletter, I seized a bold approach and emphasized the yellow. It was a beautiful day at Harold Steve's farm and it might have been nice to paint the cattle but they were constantly moving. They were very peaceful - a good thing as they are so big. They have big faces, lovely eyes and furry ears and are all black except for a wide white stripe around their middles. They reminded me of sumo wrestlers with their wide belts. And, my goodness, I never knew that crunching grass could be so noisy! I used a bit of retarder with my acrylic paints so they didn't dry too quickly in the warm outdoor air. There is something magical about being outdoors and seizing the moment to complete a painting. Most outdoor painting tends to be smaller in size because of time limitations and ease for carrying. I think this one is 11" by 14". This time I worked on getting the edges painted too. The Bunkhouse bothered me until I painted the edges at home afterwards. I think it gives the paintings a more sculptural look - and you don't have to frame them. The Group of Seven used to do small paintings outdoors and then work on larger versions back in the studio. That is something I might do with some paintings but I think this one is a small subject and works best as a small painting.